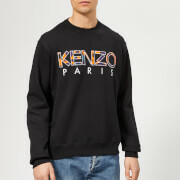 Men's black logo hoody from Parisian fashion label, KENZO. Crafted from comfortable cotton, the zip-through design comprises a drawstring hood, long sleeves and a split kangaroo pocket. Features contrasting printed branding to the hood. Complete with silver-toned hardware and ribbed trims.